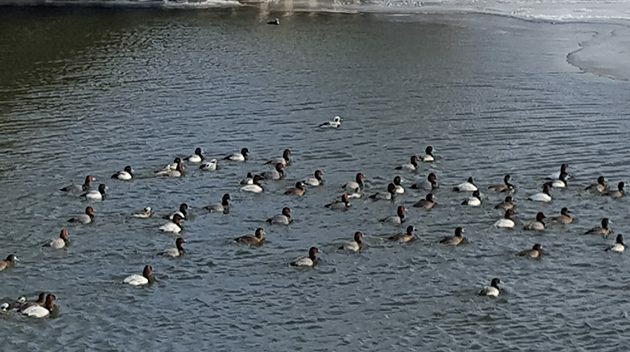 This weekend, I braved the soul-searing chill of the polar vortex to track down Canvasbacks palling around with other ducks in the open water of the Irondequoit Bay channel. I’m not saying we suffered like our friends in the Upper Midwest, but taking off my glove to quickly snap the photo above induced pain I felt for hours. Yet two days later, we’re about 50 degrees warmer! Corey did not get much birding done this weekend but on his way home from visiting his folks he spotted his first Black Vultures of the year soaring over a rest stop on the Thruway. Lacking anything better, they are his Best Birds of the Weekend. What is the National Bird of Nicaragua? Where Are You Birding This Third Weekend of October 2009?